Ready 2 Rumble Boxing: Round 2 (Nintendo 64) Graded VGA 90 . Trending at C $8.06eBay determines this price through a machine-learned model of the product's sale prices within the last 90 days. READY 2 RUMBLE BOXING: ROUND 2. Sony PlayStation 2 20 00 -PAL-. Platform: Sony PlayStation 2. Includes CD in the original case with instructions. Dreamcast Sega NTSC-J. READY 2 RUMBLE BOXING. Ready 2 Rumble Boxing Round 2 (PlayStation PS1) Brand New, Sealed! The photo is the actual item. 5 out of 5 stars - Ready 2 Rumble Boxing Round 2 (PlayStation PS1) Brand New, Sealed! 4 product ratings4 product ratings - Ready 2 Rumble Boxing Round 2 (PlayStation PS1) Brand New, Sealed! READY 2 RUMBLE BOXING Round 2 Nintendo 64 N64 OEM Authentic Video Game GREAT! 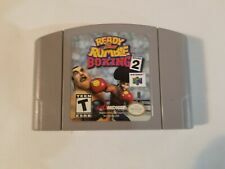 4.5 out of 5 stars - READY 2 RUMBLE BOXING Round 2 Nintendo 64 N64 OEM Authentic Video Game GREAT! 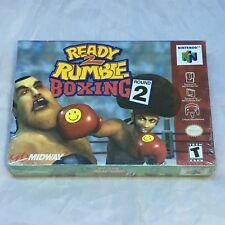 9 product ratings9 product ratings - READY 2 RUMBLE BOXING Round 2 Nintendo 64 N64 OEM Authentic Video Game GREAT! 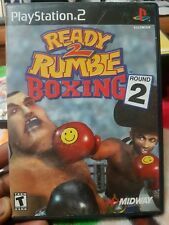 Ready 2 Rumble Boxing: Round 2 (Nintendo 64, 2000). Condition is Very Good. Shipped with USPS First Class Package. Cleaned and tested, plays great! Platform : Playstation. Playstation 2. Playstation 3. Playstation Vita. Condition : New. Nintendo Wii. HERE'S READY 2 RUMBLE BOXING: ROUND 2. DISC, INSERT, AND CASE ARE IN VERY GOOD CONDITION. SEE PHOTOS FOR DETAILS ON CONDITION OF ITEM(S). GET READY FOR HOURS AND HOURS OF GAMING FUN! THE SONY PLAYSTATION 2 ! VG = A CD/DVD with more than 2 very lite marks within the play area which still should not affect play. EXC- = A CD/DVD with 1 or 2 very lite marks within the play area which should not affect play. Disk is in good shape. 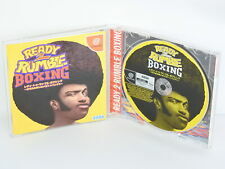 Pre-owned lot/bundle copies of Ready to Rumble Boxing: 1 and Round 2 for the Sony Playstation 1 console. It is fun to play and great to add to your collection. Then where possible we will give you the most 'displayable' copy, and let you know if there are any issues. Ready 2 Rumble Boxing Round 2. Exclude Puerto Rico, Hawaii and Alaska. Platform: Sony PlayStation 1. prompt helpful communications. Condition: New. SKU: SD94111. Ready 2 Rumble Boxing Round 2 Nintendo 64 N64 New Sealed MINT GOLD VGA 90+ WoW! Ready to Rumble Boxing Round 2 for Nintendo 64 N64. 4.5 out of 5 stars - Ready 2 Rumble Boxing Round 2 Nintendo 64 N64 New Sealed MINT GOLD VGA 90+ WoW! 9 product ratings9 product ratings - Ready 2 Rumble Boxing Round 2 Nintendo 64 N64 New Sealed MINT GOLD VGA 90+ WoW! I CLEAN ALL MY DISCS PROFESSIONALLY BUT NOT ALL TURN OUT PERFECTLY". READY 2 RUMBLE BOXING: ROUND 2. Disc has light surface scratches. Black Label. Platform: Sega Dreamcast. Genre: Sport, Boxing. Spin Card:NEW with minor fading. Format: NTSC Japan. Condition:NEW Sealed see picture, plastic seal is not in perfect condition. Get Images that. Make Supersized Seem Small.